The simulations are necessary to establish models of the atmospheres of far-distant worlds, models that can be used to look for signs of life outside the solar system. Results of the studies appeared this week in Nature Astronomy. "One of the reasons why we're starting to do this work is to understand if having a haze layer on these planets would make them more or less habitable," said the paper's lead author, Sarah Hörst, assistant professor of Earth and planetary sciences at the Johns Hopkins University. With telescopes available today, planetary scientists and astronomers can learn what gases make up the atmospheres of exoplanets. "Each gas has a fingerprint that's unique to it," Hörst said. "If you measure a large enough spectral range, you can look at how all the fingerprints are superimposed on top of each other." Hörst believes this research can help the exoplanet science community determine which types of atmospheres are likely to be hazy. With haze clouding up a telescope's ability to tell scientists which gases make up an exoplanet's atmosphere – if not the amounts of them – our ability to detect life elsewhere is a murkier prospect. With the coming launch of the James Webb Space Telescope, scientists hope to be able to examine the atmospheres of these exoplanets in greater detail. JWST will be capable of looking back even further in time than Hubble with a light collecting area around 6.25 times greater. Orbiting around the sun a million miles from Earth, JWST will help researchers measure the composition of extrasolar planet atmospheres and even search for the building blocks of life. "Part of what we're trying to help people figure out is basically where you would want to look," said Hörst of future uses of the James Webb Space Telescope. Given that our solar system has no super-Earths or mini-Neptunes for comparison, scientists don't have "ground truths" for the atmospheres of these exoplanets. Using computer models, Hörst's team was able to put together a series of atmospheric compositions that model super-Earths or mini-Neptunes. By varying levels of three dominant gases (carbon dioxide, hydrogen, gaseous water), four other gases (helium, carbon monoxide, methane, nitrogen) and three sets of temperatures, they assembled nine different "planets." "The energy breaks up the gas molecules that we start with. They react with each other and make new things and sometimes they'll make a solid particle [creating haze] and sometimes they won't," Hörst said. "The fundamental question for this paper was: Which of these gas mixtures – which of these atmospheres – will we expect to be hazy?" said Hörst. The researchers found that all nine variants made haze in varying amounts. The surprise lay in which combinations made more. The team found the most haze particles in two of the water-dominant atmospheres. "We had this idea for a long time that methane chemistry was the one true path to make a haze, and we know that's not true now," said Hörst, referring to compounds abundant in both hydrogen and carbon. Furthermore, the scientists found differences in the colors of the particles, which could affect how much heat is trapped by the haze. "Having a haze layer can change the temperature structure of an atmosphere," said Hörst. "It can prevent really energetic photons from reaching a surface." Like the ozone layer that now protects life on Earth from harmful radiation, scientists have speculated a primitive haze layer may have shielded life in the very beginning. This could be meaningful in our search for external life. For Hörst's group, the next steps involve analyzing the different hazes to see how the color and size of the particles affect how the particles interact with light. They also plan to try other compositions, temperatures, energy sources and examine the composition of the haze produced. "The production rates were the very, very first step of what's going to be a long process in trying to figure out which atmospheres are hazy and what the impact of the haze particles is," Hörst said. 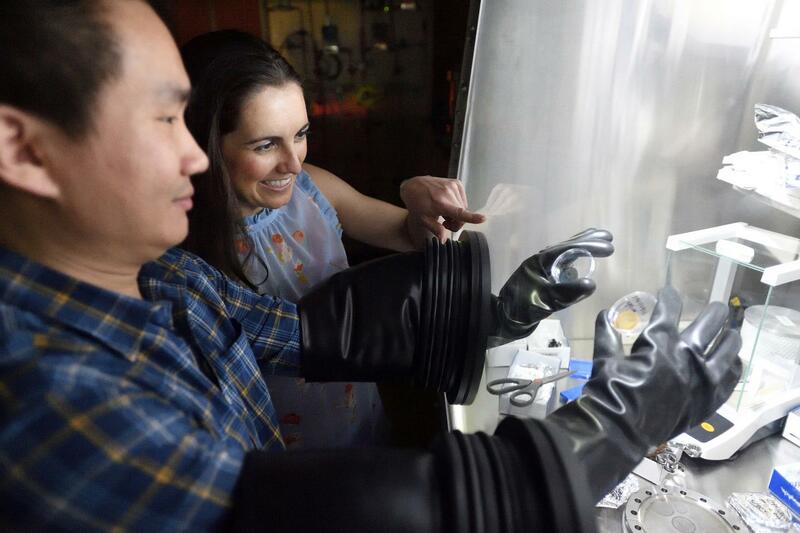 The co-authors of the paper include Chao He, assistant research scientist at the Johns Hopkins University, and Nikole K. Lewis, associate research scientist at Johns Hopkins with an appointment at the Space Telescope Science Institute. Other co-authors were Eliza M.-R. Kempton of Grinnell College, Mark S. Marley of the NASA Ames Research Center, Caroline V. Morley of Harvard University, Julianne I. Moses of the Space Science Institute in Colorado, Jeff A. Valenti of the Space Telescope Science Institute and Véronique Vuitton of the Université Grenoble Alpes in France. NASA Exoplanets Research Program grant NNX16AB45G paid for the study. The Morton K. and Jane Blaustein Foundation supported Chao He.